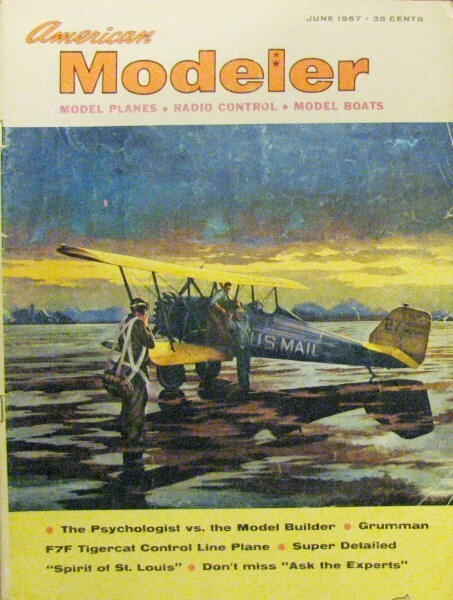 Walter M. Jefferies, Jr. inked another masterpiece for the June 1957 issue of American Modeler - the Spirit of St. Louis. 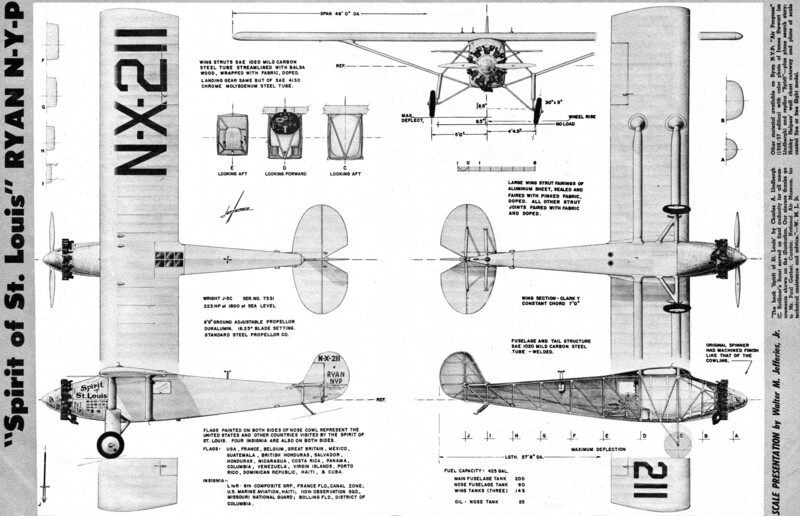 This 5-view drawing reveals many details of airframe components, fittings, and rigging. Much more detailed plans are available from sources like the AMA Plans Service if you are thinking about building a version of "Lucky Lindy's" famous aeroplane. Interestingly, the August 2016 issue of the Smithsonian's Air & Space magazine reported on a pair of pliers discovered under the floorboard of the cabin. Mr. John Norman, owner of JNE Aircraft, made the discovery while at the museum making measurements. He was using a video boroscope, donated by RF System Lab, in search of Lindbergh's missing log book when he found them lying out of visual sight. Scale Presentation by Walter M. Jefferies, Jr.
"The book 'Spirit of St. Louis' by Charles A. Lindbergh (C. Scribner's Sons) served as final authority for all measurements shown on the illustration. Our sincere thanks go to Mr. Paul Garber, Curator, National Air Museum, for technical assistance and advice." - W. M. J., Jr.
Other materials available on Ryan N-Y-P: "Air Progress" (1956/57 edition) with color photo of James Stewart (as Lindbergh) and replica "Spirit" - plus plane search story; Hobby Helpers' wall chart cutaway and plans of scale control line or free flight model.